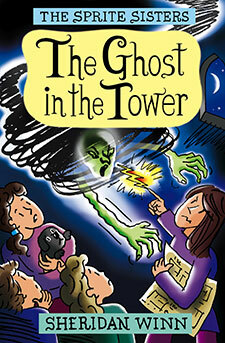 ‘It’s real – I tell you, it’s a real ghost!’ gasped Marina, her face fraught with terror. ‘But where did it come from?’ cried Ariel. When Glenda Glass conjures up the ghost of her wicked ancestor, Margaret, the atmosphere at Sprite Towers gets exceedingly chilly, and the Sprite Sisters’ Hallowe’en party turns into something far more sinister than anybody had planned. With Grandma away, only the sisters can rid Sprite Towers of the phantom. And that means entering the portal in the tower and risking their lives to change the future.